I'm actually not a huge fan of The Wizard of Oz, but I couldn't help noticing the similarities. Here I am on the yellow brick wall and my husband definitely doesn't live in Kansas anymore. Then there is the whole "little dog" bit. She represents both the obvious Toto and the part where someone needs a brain. And here we are in the Emerald City. Such a glorious place. You can say what you want about our weather, but this place is just spectacular. Looking out over the sound from Discovery Park. I learned something important over the years. The bitter parts in life are just there to make the sweeter parts that much sweeter. The gray days are there to make the sunny ones that much brighter. Looking forward to more t-shirt days! "The part where someone needs a brain." Teeheeheehee. Hilarious. I very much liked this look when you posted on chictopia. Goes right along with all the prim proper looks shown recently at NY Fashion Week. Thanks so much for telling me about Pinterest. I looked, but only found a few photos. Perhaps the others aren't tagged with my blog/name. Your hubs is from Kansas? Small world! I love the outfit. Haha, love all the comparisons to the Wizard of Oz. That movie scared me when I was little! "The bitter parts in life are just there to make the sweeter parts that much sweeter. The gray days are there to make the sunny ones that much brighter." well said. i definitely need to store this in my pea-size brain so whenever the going gets tough, i would be able to remind myself that. love love that bright yellow wall! it really makes your photos pop!! Hi, I found you on Chictopia. Love your style, and I am also an Emerald City gal. Added you as a friend, and now am following your blog! I'd love if you'd check out my blog. 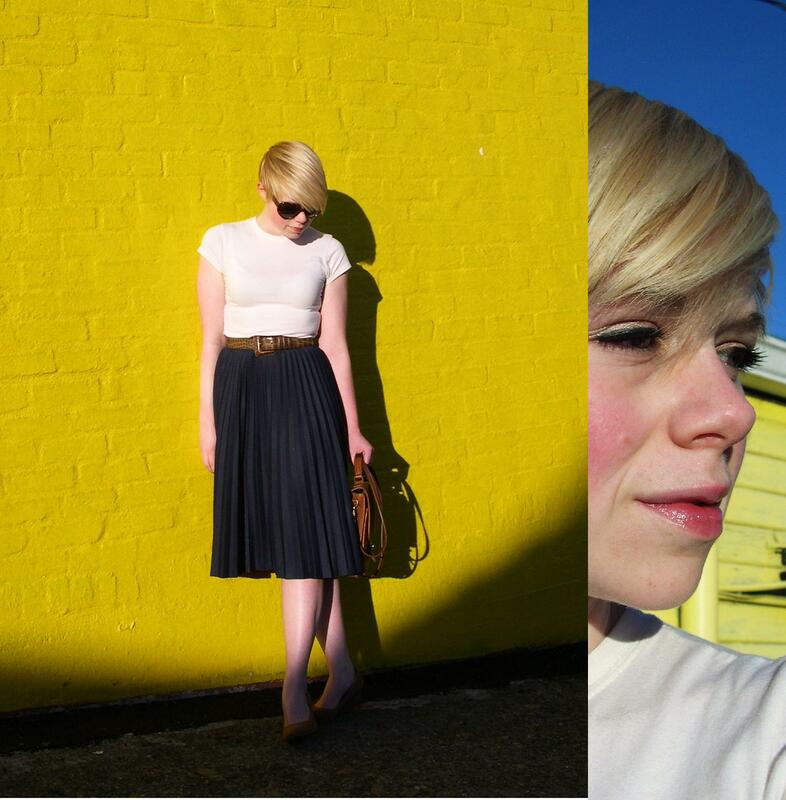 What a beautiful yellow wall, I'd love to have one of my own to take pictures against! :-D Love the doggie too! Gawww! As always, you look like perfection!